Welcome to the Barbercraft website! Where you can apply for staff, report players and glitches, play fun forum games, get news on the server, and buy things from the Rank Store with money or use your votes to buy things from the Vote Store! Be sure to connect your Minecraft account to the Barbercraft website to properly use all features! Barbercraft is one of the most fun and unique Multi-world servers around! 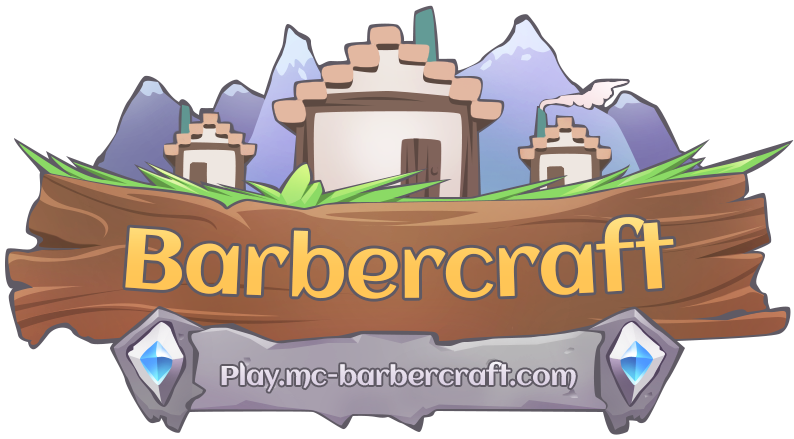 The main focus of the server is to offer a varied experience for each user, To achieve this, Barbercraft offers a large range of custom game worlds including Creative, Towny Survival, Mini-Games, and SkyBlock! In addition to custom mechanics, we also use plugins such as Slimefun and TinkerTools to add over 1000 items and blocks into the game. These plugins add stuff that vary from new tools and jetpacks to nuclear reactors to power all the new machines and systems found on the server. Unlike most servers that offer similar mechanics, you can join Barbercraft and access all of this with your normal Minecraft client! So whether you want to come and just play regular Minecraft on our beautiful Custom World or dabble in all our extra features, we look forward to seeing you on!